Rabbi Aryeh Leib Lipskier, a'h, alias 'Leibel Poltaver', served as the Rabbi of Poltava, Russia seventy years ago. Last night, his grandson, son of the shliach and Rabbi of the city, Rabbi Yitzchak Segal, was circumcised and named after his grandfather: Aryeh Zeev. 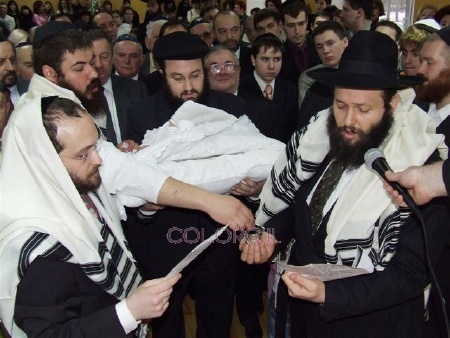 The ceremony was held by Rabbi Yaacov Gaissinovitch of Donetsk, a Mohel with Brit Yosef Yitzchak who serves as the Chief Mohel of Ukraine. Rabbi Gaissinovitch also performed Britot Milah for two other locals at this opportunity; one was a five-months-old child and the other a 50-year-old adult. The ceremonies were held at the 'Or Avner' school in Poltava.